Many people wrote in to say that there were tyres in the river Stour between Corngreaves Hall and Hayseech Road. Compared to other sites we have cleaned the problems are much less dramatic, so in some ways it could be called a ‘mini’ event. 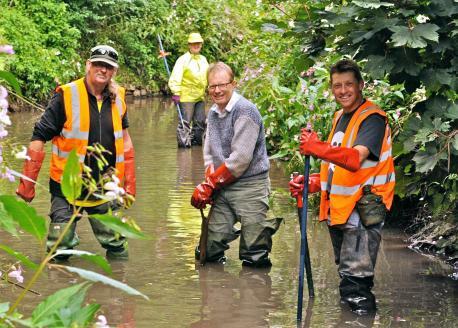 We will still need people to help get the tyres out (I will bring the waders) litter pickers, and people in wellies to fish litter out of the river debris. Our last event received good publicity (with excellent photo) in the Halesowen News and notification of this new one, so hopefully this will have reached the local community. SERCO who are contracted by Sandwell to do rubbish collection have kindly agreed to support the event and will send two men (with van) who may even help with the clean up! Please bring some strong gloves and a sturdy rubbish bag if you can, if not, don’t worry! We also have some equipment. Thanks to Sue Foster for organising some more litter pickers from the Council and to Maxine Tranter for an update on what needs to be done there. It is very important that everyone realises that being an unfunded voluntary group we have no insurance to cover accidents. Therefore each person must take responsibility for themselves and be aware of those around them.